The big news of the day is China’s declaration of an Air Defense Identification Zone (ADIZ) over parts of the East China Sea, notably furthering the potential for conflict with Japan over the Senkakus/Diaoyus. Per guidelines released Saturday, the policy requires non-commercial aircraft in the space to pre-arrange flights with China’s government – effectively creating a pretense for action against Japanese military aircraft should they fail to comply with rules set for a space they likewise consider their own. Taiwan, which also maintains claims to islands it calls the Tiaoyutai, has voiced regret over the move. 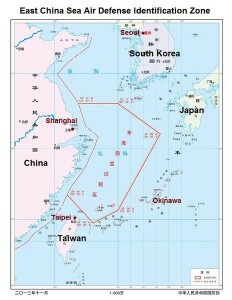 Additionally, the zone may (unintentionally or intentionally) heighten tensions with South Korea as it extends close to South Korea’s Jeju island and appears to include the disputed submerged rock “Socotra Island” claimed by both South Korea as Ieodo and China as Suyan. h/ts to @zacharykeck, @wayale, @dmhartnett, @washburnt for sources. I just watched this on the news and the impression I got was that the ROK government appears to be treading cautiously on this matter. On the one hand, they want control over the disputed Ieodo, or Iodo, but they’re also afraid of offending the Chinese. Hopefully this doesn’t lead to another EP-3 incident… It will be interesting to see what the Official USG reaction to this declaration will be.